This is an enormously popular time of year for travel, but it isn’t so easy for many families. If your child is on the autism spectrum, it might be difficult for you to imagine taking a vacation anywhere. After all, people with autism spectrum disorder (ASD) thrive when they have schedules, and disrupting their typical daily routine can be quite distressing for them. However, this doesn’t mean that your child will never be able to travel. If you can properly plan for your trip, you can ease the adjustment for your child with ASD and have fun with the whole family. 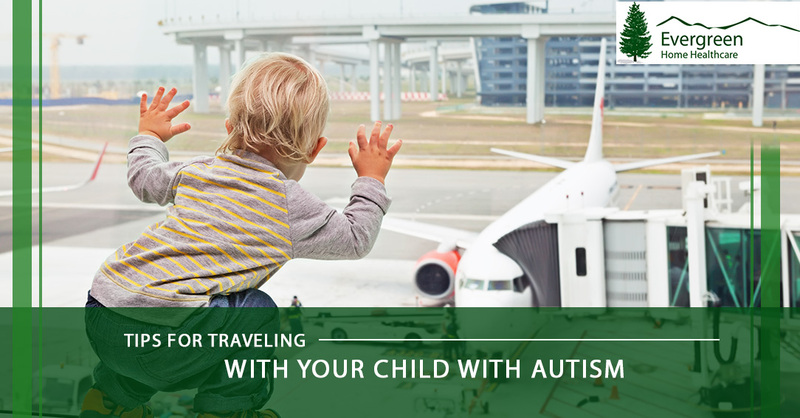 Here are some tips for helping make your trip more enjoyable for your child with autism. Vacation involves interacting with many different environments, and this can be especially stressful for children with autism. Planning your trip starts with a realistic picture of the needs of your child before you even choose a destination. Children on the spectrum struggle with social interactions and vacation involves a lot of them, so it’s important that you plan based on what your child will genuinely enjoy. Because people with autism are especially sensitive to other people’s stress, it may be best to pick a destination that doesn’t require sticking to a rigid schedule, such as the beach or the mountains. These types of places generally do not require much hurrying, and the schedule can be more flexible. For more structured trips, think about what your child likes to do. Maybe they enjoy amusement parks, or love being in nature. Wherever you go, there should be activities that your child is interested in to make it a less stressful experience. Try to not make the agenda too extensive, as this can overstimulate your child. It can help to involve your child in your planning. This can make it easier to factor in your child’s interests, attention span, and processing abilities. Make sure to research your destination extensively, and talk to your child before the trip about how you are getting there, where you will stay, and what activities you will do. When you are making your arrangements, reach out to the hotel, airline, amusement park, or restaurant and let them know that you’re traveling with a child with autism. This way, you can ask for certain accommodations and express your needs beforehand. If any incidents happen, you can rest assured that the staff is familiar with your family’s needs and can provide assistance if needed. Now that autism awareness is at an all-time high, you may be surprised by how prepared businesses are to accommodate children with ASD. There are special safety considerations to make when you have a child with autism. In stressful situations, children with autism may flee or wander away. This is particularly dangerous for children who are nonverbal. This is why it is important to make sure that your child has identifying information on them at all times. Many parents choose medical bracelets or necklaces, but if this is too much sensory stimulation for your child, there are also ID tags for zipper pulls and shoelaces. If your child is nonverbal, consider putting an ID card with contact information, allergies, and an indication that your child is nonverbal. It’s important to make sure you have everything that your child needs before you leave on vacation. Start by writing out a checklist of the essentials, including your child’s go-to soothing reinforcements. You also want to make sure that you have plenty of distractions on hand. Think about how your child functions on a daily basis and what familiar items help them during their routine. Some might include snacks, favorite books, toys, diapers, and assistive communication tools. If your child is feeling anxious about you packing everything they need, give them the opportunity to check your suitcase so that they can feel comfortable. If your child is feeling wary of going on the trip, it may help them if you review what they can expect to see or do while on vacation. You can show this through pictures, or roleplay different scenarios that may come up, such as going through airport security, riding on an airplane, or walking through an amusement park. This can help reduce stress, helping your child behave better when the time comes. You know your child best, so you can approach this the way you think they will be most receptive. Some children will need weeks to prepare, while this will cause others to feel anxious for weeks in anticipation. On vacation, your child will not be able to follow their usual routine, which can give them extreme anxiety. This is why it is important to understand what triggers your child, and make accommodations for that. For example, they may get tired around the same time every day — use that time as an opportunity to take a break, perhaps going to take a nap or for a leisurely swim. You may also know that they tend to get overstimulated if there is too much to look at, so you might limit the number of hours you spend at the amusement park, for example. At Evergreen Home Healthcare, we understand that raising a child with autism offers both unique joys and unique challenges. You may benefit from extra assistance through our pediatric home healthcare in Denver. Contact us today to learn more!